"There is a beautiful valley on the left...a patchwork of greens, browns, greys & yellows." "Imagine a wide landscape, flat & scantily wooded & what trees remain blasted & torn, naked & scarred & riddled." "Wherever the traveller comes upon a little company of our graves, he will know that he is near the site of some old hospital or clearing station, where our men were brought in from the line." "No-man's land under snow is like the face of the moon: chaotic, crater ridden, uninhabitable, awful, the abode of madness." "...the greatest monument I have ever seen to the handiwork of man." The exhibition will be from the 18th October - 25th November 2018 at Cornerstone Arts Centre, Didcot, Oxfordshire. The Battlelines Redrawn Project is a study of how some of the battlefields of the First World War have REGENERATED over the last century. 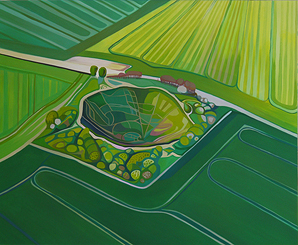 My focus centres on the landscapes of the Ypres Salient and The Somme and references works by War Artists Paul Nash and William Orpen and the poet and writer John Masefield. Creating powerful paintings of chalk landscapes from France and Belgium which tell stories from history and show how the landscape has regenerated. Connecting with the countryside of the North Wessex Downs Area of Outstanding Natural Beauty. 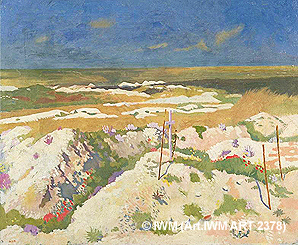 Drawing on comparisons between Nash, Orpen & Masefield, their responses to the destruction of the battle torn landscapes and connections to the chalk downlands in England. Examining the landscapes of the North of France and Belgium alongside the Berkshire Downs. 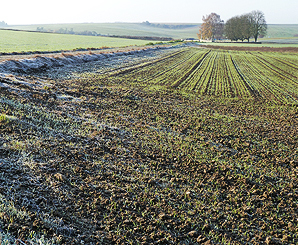 Researching how the destroyed landscapes regenerated over the past 100 years.